How do you find your artistic voice or style? You don’t have to find it. You already have it. You already have favorite colors, favorite textures, things you like. Your family knows your speaking voice anywhere, not just by how it sounds, but by what you choose to say and the way you say it. Your handwriting is instantly recognizable, right? Your style is already there, but for most of us it’s just such an integral part of our personhood that we don’t even see it. That’s why others can often see our style when we can’t. It’s been said that the only way to find your personal voice in art is to make a lot of art and that eventually you’ll be able to develop it. I think that’s true, but not in the way you might expect. Yes, we do have to develop our voice. But it’s not something that we choose, like picking a movie genre, and deciding that “rustic” for instance, is going to be your “voice” and then working on that “thing” until you get it “right”. When I was a freshman in college, I loved Claude Monet so much that I stayed up all night painting this. It’s a blatant copy of Monet’s “The Petite Creuse River“. I learned SO much about color and light and how to handle paint, and got to “Be Like Claude” for a few hours, and this painting has been on display in my home ever since. Let me take a moment to talk about fear. Because it’s the real problem here. We are all so deathly afraid of being seen as foolish, as being talentless hacks whose work is only fit to be the laughingstock of the office party. (I think the horrors of our pre-teen years left indelible stains on most of our hearts, honestly.) But still, we long to create. It feels good, like blooming spring flowers in our souls. So we begin to create in the voice of others. We make what is safe. We copy an idea, we imitate a look, and essentially we wear the voices of artists that we enjoy. Just like a teenaged girl in a dressing room, we try on lots of styles, striking a pose and twirling our skirts until we find one that feels right. I think this is normal and a perfectly wonderful way of learning skills and techniques and frankly, having a really fabulous time. There is no shame in this! Now, back to finding your own voice in art. As we stand there in our fabulous borrowed outfit, many of us begin to wonder what our own “outfit” actually is. What is my voice or style? Like I said above, your style is already there. But you’ll never see it if you’re “wearing” the style of another artist. In order to see your own voice, you’ll have to “undress” and drop the styles that you’ve been “wearing”. Of course, that feels naked and raw and bare and very exposed and scary. But the amazing thing is that you don’t actually need to cover up. To find your voice you merely need to uncover, allowing the styles and voices of others to fall to the floor, becoming just a part of your artistic past. My father, who became a sculptor at age 68, says that at some point you have to lean into it and face the fear and begin to make what you want in the way that you want it. And once that happens, you stop relying on imitating the art, voice, and styles of others. You begin to make what your own SELF wants. In essence, you begin to get out of your own way, and your voice and style begins to be able to be seen and heard. It was always there, but you were covering it up by wrapping yourself in the warm, safe voices of others. Once you start creating things without speaking with the voices of others, you can begin to see the authentic “weirdness” that is your very own. Your voice will be able to be heard, your style to be seen. And if you listen to it, you’ll be able to start to refine it, bringing the skills that you’ve learned along the way, and creating wonders that ring true and real and authentic. You will have found your style. Even though it was there all along. Meg Newberg (yes of Polymer Clay Workshop!) is one of my favorite painters. I’m lucky to have this small study she did of cactus in the desert sun. I would know her work anywhere, and if you think about it, you see her love of light in her polymer clay canework as well. Robin Mead has a strong voice that uses her bright, clear colors in swirling, organic paths. This little bluebird sits on my studio wall. He makes me happy. Thanks for reading my little commentary on helping you find your artistic voice or style. It’s been a bit of a departure for me as I usually write more about polymer clay topics. But I also think that the emotional side of our creativity is just as important as the tools and materials that we use. If you think this article would be helpful for other artists and crafters to read, I’d love it if you’d share this article with them or perhaps in your favorite artistic social media outlets. And I’d love if you’d join me on this artistic journey by signing up for emails. Thank you! Ginger, I feel like you singled me out in your article, you describe me so aptly. I have always said I am a craftsman, I can make pretty things people will enjoy and buy, but that I am not a ‘designer’. I am not that person who will reach out of the box, who will reach out of the comfort zone. Whew! An absolute gem of a thought provoking article and I, for one, am delighted that you penned this. So many of us do wonder what is “our” style or even if we have one. Thank you so very much, Ginger for voicing what many find difficult to express or even think through. If one of your immense talent feels this, then…why, then it must be absolutely normal that I feel it. This is what consciousness-raising did for us in the old days…thank you. Oh gosh, I think all of us feel like this, no matter what our experience and level of expertise. If experienced stage actors still get stage fright after years of doing it, then that tells me that self-doubt and fear are just part of the human condition. I think it would be pathological to NOT feel doubt. This hurts my heart to hear that you were so hurt by someone’s careless disregard. And the amazing thing is that woman likely had no idea that her actions were hurtful. They had to do with HER and not with you. Yes, please, make new brooches. Make whatever your heart desires. Those who are qualified to appreciate your work…WILL. And those who are not qualified, well, it will go right over their heads anyway, just like the way your work’s value was completely missed by that careless woman. <3 Yes Ginger I am. Only this time they will be displayed in glass cases, protected and given the respect that all the hours, nay YEARS of work has earned them. I’m so sorry you went through this experience. And you are absolutely right that when we put our work out there, we are allowing ourselves to be vulnerable. And Ginger hit the nail on the head in this piece by noting that everyone has different tastes and styles. I know that for my work, I just “do my thing” knowing full well that some will like it and some won’t. But, if I’m being true to myself in my art, it doesn’t matter if some won’t like it. I’m quite sure that there is no single style of art that absolutely everyone loves and to try to create things to please others would most likely not please me. Thank you, Ginger for raising this important topic in such an approachable way. 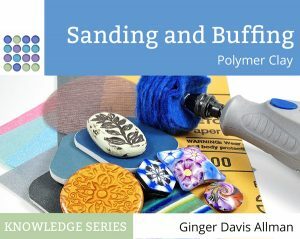 Thank you so much for your gift of sharing your knowledge & just not about polymer clay…you are one awesome lady, Ginger. I hope to meet you personally one day! Yep… Still trying to find my voice. sometimes I fear its impossible to be new and different with twist and flair. In the advent of resources and mass of visual inspiration available via the internet I know I get extremely overwhelmed and I end up staring at my desk… Or worse… Organizing. Lol which leads me back to creating. Lol. Yeah I love polymer clay, but have always wanted to explore watercolors. So I am. No reason I can’t try both. Maybe exploring a different medium will bring some much needed change. That brings up a good point. Sometimes the sheer number of choices makes us feel like a deer in the headlights and we lose our steam. We get paralyzed. Switching gears is a really good idea. Lessons learned in one medium will apply to another. That’s how I feel now. Thank you for what you are doing, Ginger. It is very important for everyone. As I told you on FB, this comment had me sitting in a big blubbery pile of tears. Thank you. I do think there are important messages to share with the world and if my ideas are getting out there and making a difference, then mission accomplished. We all win. As someone that had been in structured work positions most of my career (prisons, work-release, police officer), during my off time, I had no problem expressing my creative side. However, now that I left these jobs, I am still stuck in this regimented work mentality that seems to block my creativity. Even the work I currently do, making handbags and recently starting a jewelry line, seem stiff in my eyes. Where I was once free-flowing with ideas and results during the work years, is suddenly stunted now that I’m not working. I read your article with interest because it really struck a cord with me in trying to find that crack in my rigidity so I can finally let out what has been in my mind that just hasn’t been able to make it out into my work. It was truly a wonderful article. That’s an interesting point to bring up. Our creativity, freedom, and fear are part of the dynamic whole of our lives, not just one segment. And if something else in our life changes, the balance has to change, too. It sounds like you have a strong need for order. Maybe there’s a way of creating order in your work that will meet that need, allowing the artist side to loosen up and flow. That’s really got my mind working. Thank you. I can relate to so much that you have shared here. My creativity has dried up at the moment. Instead of just accepting that this too shall pass, I realised that fear of expressing myself is a large part of that block. Thanks for sharing. True. Especially when you’re doing something that nobody else is doing. You have to be willing to try things and take risks. I love that you do that with your work, Jon. I’m so glad you wrote this Ginger! When I’m working with art students I tell them there are no mistakes, only learning opportunities. It’s hard to have someone critique our work. I’m a house painter by trade. We do high end homes. I watch contractors in my circle get really offended when someone questions their work. We take great pride in it. We feel like we are under attack. Sometimes others have legitimate reasons for questioning us on it. Other times they have more money than brains. We simply need to do our best. And as time goes by our best gets better. Thanks again. I like that. No mistakes, only learning opportunities. We learn from everything if we allow ourselves. I find that when I sit down to play with my clay, that is truly what I’m doing. Allowing myself to return to the wonderment and open-hearted place where the child in me resides is what informs my “work” (a big-girl term for playtime!). I sometimes, intentionally sit down with NOTHING TO DO and allow the flow of what moves through me. I think it is why I don’t do pieces that resemble some THING, you know–figurative work that requires a meticulous and focused approach to mimicry, or recreating–rendering. I admire those who choose this method, as a great deal of patience and continued focus is required for mastering the skill over time. I prefer to approach the experience as a child approaches white paper with various colors of cold, wet finger paints smeared all over her hands…freely with excitement and a wide open heart. It is also the reason for my studio madness that has no end. When was the last time you watched a child tidy up her area as she was fully in the swing of creating her masterpiece? Where are the children when the teacher is picking up the array of crayons scattered all over the worktable that is littered with colorfully scribbled pages? Outside on the monkey bars, probably! There is time for detail but for me, that is usually, at the end after I have made what rests in front of me. It is when it is time to call forth the “big girl” to “revise the rough draft”. Criticizing my work causes me to suffer. Now why would I do that intentionally. Lately, I’m trying the approach of rather than judge and berate the creations I simply say the words, “Next time.” Sometimes though, there are no revisions and that creation is an A+ paper the first time around. ” Wow,” I think to myself, “*I* made that!” But then I am humbled and bow to the muse that flowed through me and created the pieces THROUGH my eyes and my hands, not BY them. She is ALWAYS there, the muse. But like a powerful river behind the dam, she is either allowed to flow or held back by the giant wall that detains her. Become childlike. Revel in the wonderment. Your comment caused an entire line of thought that I’ll likely flesh out in a future post about the difference between criticism and critique and the purpose for each. Thank you for sharing. I love one idea will spark another. Conversation at its best! So many people have had really great results with that book. I do try to do “morning pages”, I have for years, and it really does help. I think the idea of authenticity comes into play here. It’s hard to feel “right” about something that isn’t from our heart. It might be helpful to ponder a while on what aspects of the piece don’t feel “right” and see if that sends you down any paths of inquiry. I find this whole art thing to be an incredible journey into self, and that’s one of the best things about that book…it helps you work that out. Like I always say to my grandchildren when we’re playing with polymer clay…..you cannot make a mistake, this is YOUR artwork and as long as YOU like it, it’s beautiful. And of course Grandma thinks everything you guys make is absolutely gorgeous! Isn’t it amazing how kids are so much better at making things with their own voice? Thanks for the great insights, Ginger! Another resource that addresses our creativity is the little book “Art and Fear.” I hadn’t realized how much fear I had until I read it, and now that I recognize that fear I can deal with it. A very important thing, as I see from many of the comments above. I’ll have to find that book. Sounds like a good one. Thanks! Right now I am trying to find myself normally it’s never been this hard to do. With quilting I fell into my designs and style right away same with my embroidery and cross stitch as for painting that has always been my own since I was painting from the age of 4-5 won my first art contest at the age of 7 🙂 so why is it now I have started with polymer clay and beading I have lost that certain something that has always been there. A light bulb went off in my head after reading this, and into the studio I went. Thank you so much for writing it!! Regarding Gemma’s comment above: I think that women who have worked in structured environments and carried responsibility have their own personal (usually rather high) standards of professionalism. When you have ‘job is job’ and ‘hobby is hobby’, artistic endeavor can often be a very free-flowing activity. But if the situation comes about that the job is no longer there, and you have all time in the world for your hobby, and you also have no financial need to market your art, still something funny seems to happen. Simply by changing the major focus of life to art work in some form, I believe that the standards from ‘job’ somehow secretly sneak into the brain by the back door, so to speak – after all, they’ve served us well for years on end – and that’s one reason for creativity drying up. That’s an interesting concept, and one that I’m going to give some thought. Very insightful. Thank you Natalie. It’s funny how it really is very different than the original, even though I thought it was identical at the time. It just goes to show you that I saw different things in the original then than now. What a timely, thought provoking article, Thank you Ginger. I am recently retired, from the financial sector. I previously created jewelry pieces, which were sold is boutiques. It was a hobby, and I had pieces that customers bought falling apart. (Limited crimping skills) and also boutique owners saying they wanted this and that to be made bigger, or smaller, to add one tiny crystal to pieces and on and on. I was discouraged, disappointed, and handed in the towel. Now that I have retired, I have honed my technical skills, I love working with jewelry, and recently fell in love with PMC. What a fabulous medium! I am enjoying your articles, tips, and philosophy. I am back in boutiques, and turn down those who want to re-create my creations. I still have moments of self-doubt, look at pieces the morning after and think, “What Garbage!” Everyone has artistry within, from wherever, I would like to encourage everyone to HAVE FUN with it, relax, laugh at yourself, and do what you LOVE! The realization? Be me, be true to MY passion, my ideas, my viewpoint, my dreams for this is where I will (and have in the past before I sought money before pleasure) find my true joy and realize my God-given ability to see things as no other being can, MY WAY, not the way others see things, that is their passion and their vision. I can’t utilize what God gave them, he gave that to them, and he gave me my very own. For that I am grateful, now, let me begin showing that gratitude by NOT mimicking what I THINK people want! Thanks for this article Ginger – I totally agree. I have shared it on my Facebok page. Well Ginger, thanks for this…as I can see there’s a lot of ‘stalled’ people out there! I see ideas, I have ideas, I go to do them and get snagged into doing still yet another type of idea! I’ve found that my new plan is to make things just for me and if I make something good enough to give away…I do. It’s helpfull to know there are others out there that think the same. I think creative overload is becoming more and more of a problem in our modern age of social media and endless streams of other people’s agendas. It’s hard to hear our own voice in all of that. How enlightening! Even all the comments. I can’t wait to savour all of them. Thank you so much for sharing. I am enjoying all that i read of your thoughts, feelings and guidance. Thank you. I am very new at polymer clay.